For a taste of home-cooked chicken without all of the prep work, look no further than this deluxe pulled chicken to bring fresh-tasting chicken meat to your restaurant or diner! 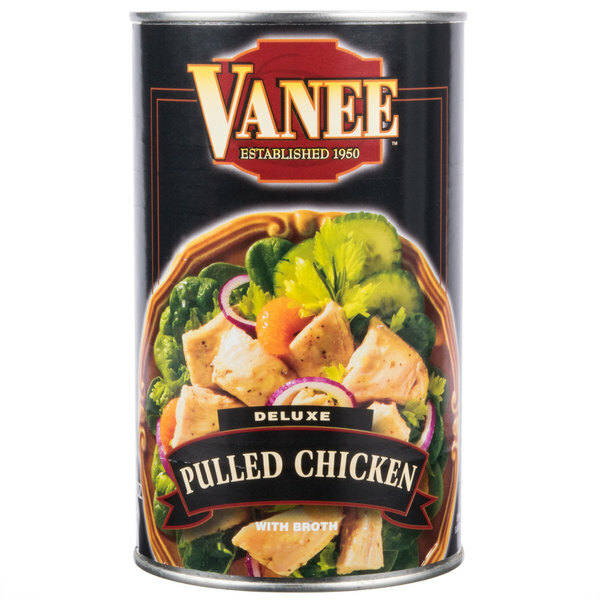 Hand pulled and hand packed, this Vanee 456DC deluxe pulled chicken features natural proportioned white and dark chicken meat that has been slowly cooked in its own natural juices, creating a savory flavor. Family owned and operated since 1950, Vanee offers deliciously-consistent and convenient products at a great value. Make the perfect pulled chicken sandwiches with this pulled chicken meat. A good source of protein, this chicken is extremely versatile-perfect for a limitless number of entrees! Experiment with new chicken recipes, or use as an ingredient in soups or chicken salads for something more expected. Create fiery Mexican-style tacos or top off signature salads. Whichever way it is prepared, this tender and juicy pulled chicken meat has a time-honored taste to help you create dishes that will keep your customers coming back for more! A great quality can of deluxe pulled chicken that taste great. The chicken is perfect for adding to our chicken noodle soup or topping sub sandwiches. A wonderful find that makes meal prep so much easier. The pulled chicken is very tasty, not overly salty, and well cooked. One can use this meat in sandwiches, soups, salads, or eat by itself. The price is a little steep for the amount. Who knew canned pulled chicken would taste so good? this chicken product seems to be cooked in broth over a long time because it was tender and amazingly good tasting, I made the best chicken salad i ever have with it. 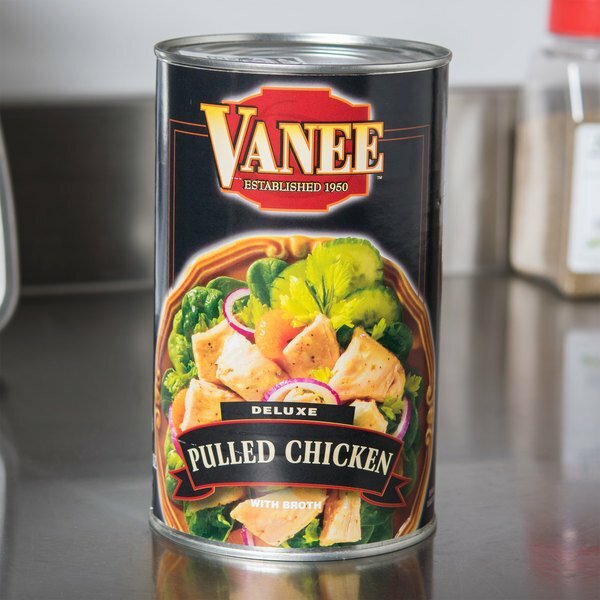 Pleasantly surprised in the great quality and taste of this Vanee Deluxe Pulled Chicken. It is fantastic and has many uses! Super fast shipping, too! Thanks, Webstaurantstore, for carrying this great product! A very good quality can chicken that is super juicy and tender. A great chicken to add to our chicken pot pies and also perfect for soup. The can deluxe pulled chicken is wonderful for making quick and easy chicken salad. The chicken is super tender and very tasty. A nice product. Wonderful to have a case of this nice usa grown pulled chicken! it's completely real and no added things except salt and has huge pieces and works great in salads or sauces or pies-so easy! Ordered one can to see how it stood up to expectations. It surpassed them by a mile. Imagine how great chicken tastes and that's how this is! Best part is that it really is chunks/shreds of chicken. We were concerned it would be boiled down stuff the consistency of canned tuna but instead was very acceptable pieces of tender flavorful chicken. Served it at an event and everyone raved about it! This is good for salads, soups, smothered in barbecue sauce and eaten on a bun and so much more. It is a versatile and good tasting product. 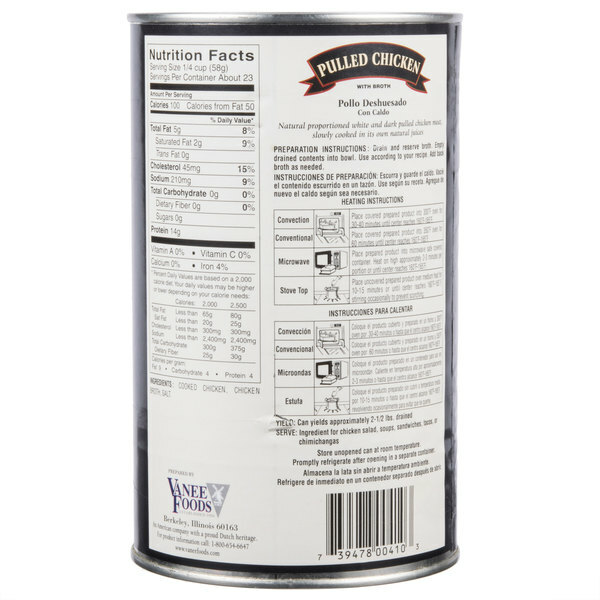 We will definitely be buying more of this canned chicken from WEBstaurantStore it's perfect for soups and salads and excellent white and dark meat big pieces and very tasty . I was surprisingly happy with this chicken. It tasted very fresh and he texture was great. It may not be something you use everyday, but good to have on hand for quick dinners or emergency's. It makes a very tasty chicken salad! I can also see this being a good option for some restaurants. A true favorite of ours. This can is packed full of chicken, ready to use, great size pieces. It saves a great deal of time pulling chicken off the bones and tastes great. We use it soups, stews, pasta dishes, salads and even for our chicken salad. The taste of the meat was good, as was the texture of the chicken. I added the chicken to a simple garden salad. This chicken would be perfect to make in a chicken salad sandwich.